Grace Alliance was originally an idea from a number of pastors who wanted to connect grace churches to each other and to the ministry of Pastor Joseph Prince from New Creation Church in Singapore. The idea was to create a platform that was different from any other church network. At it’s heart Grace Alliance is about providing relationship, support and friendship for pastors. An initial gathering in 2015 in Zürich Switzerland attracted around 80 pastors and was a great success. Pastor Prince gave valuable input and encouragement and the sense from those who attended was that Grace Alliance had an important strategic role in developing healthy grace based churches in Europe and beyond. The story continues to unfold. We are a part of a grace revolution that is being used by the Lord to bring hope and freedom to millions of people around the world. You can help us write this story of love & unmerited favour in the lives of your church as a member of Grace Alliance. 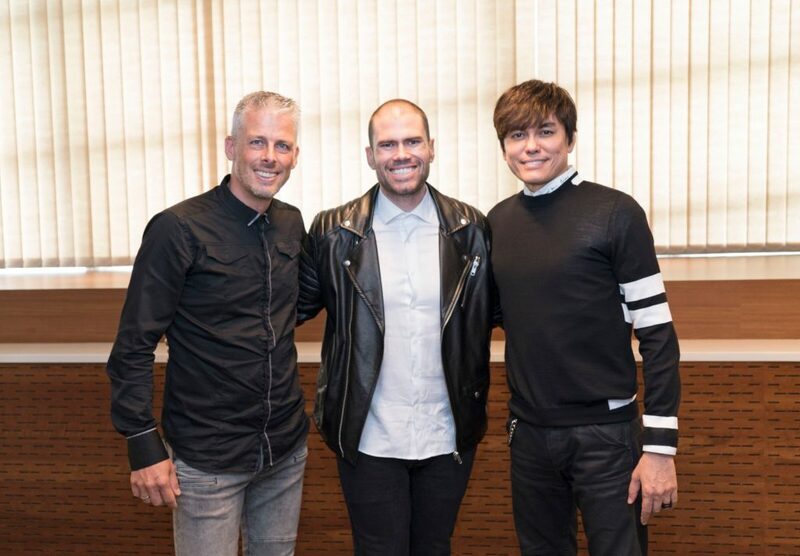 Pastor Marcel Gaasenbeek (Chairman of Grace Alliance) and Pastor Joshua McCauley with Pastor Joseph Prince from Singapore. Grace Alliance is not just another church growth network but a genuine group of churches who preach Jesus at the centre and the full gospel of grace. We want leaders to discover more of the Lord’s unmerited favour in their own lives and also to become effective ministers of grace. Our resources are there to help local churches grow in and function in grace. The purpose of Grace Alliance is to connect these churches to the leaders and ministries that will help them to develop themselves and their churches in grace. Those who have accepted Christ are in no danger of committing this sin, which is why the apostle Paul, who wrote two-thirds of the New Testament, never mentioned an unpardonable sin. Instead, he assures believers that all their sins have been forgiven because of Jesus’ one sacrifice at the cross (Hebrews 10:12–14). The significance of the anointing oil lies in its pointing us to Jesus’ finished work at the cross. In the same way olive fruits have to be crushed in order for the oil to flow out, Christ was crushed at different points in His passion so that we may enjoy wholeness in every area of our lives, and that God’s blessings may freely flow toward us. His “pressings” began at Gethsemane (meaning “olive press”) in a time of darkness, both literally and spiritually. He said to those who had come to arrest Him that night, “…this is your hour, and the power of darkness” (Luke 22:53). The Bible says He was “in agony” (Luke 22:44) as He contemplated what awaited Him from then on to the cross. It was a very dark time for our Lord. He was pressed so that we can be called “out of darkness into His marvelous light” (1 Peter 2:9), and to walk in this light. Jesus’ crushing continued at the scourging post where He was scourged violently by the Roman soldiers. He took lash after brutal lash, bearing every stripe until His skin was torn and His bones exposed (Psalm 22:17, 129:3), all to purchase our healing and health. The prophet Isaiah tells us that “by His stripes we are healed” (Isaiah 53:5). As the olive is crushed or pressed a third time to yield its cleansing virtue, Jesus’ crushing climaxed with His being nailed at the cross. He was crushed under the judgment of a righteous and holy God because He was carrying our sins and being punished for them. He shed His blood at Calvary to wash away all our sins, making us whiter than snow. I have prayed and believed God to heal me, but I have not yet seen the healing. When He was on earth, Jesus, God’s perfect will in action, healed all who were brought to Him (Matthew 4:23–24). Jesus is the same yesterday, today and forever. He is still willing and able to heal and restore wholeness to your body today. The Lord does not, and will never, withhold healing from you. So, regardless of whatever symptoms you might be experiencing in your body, come boldly to the throne of grace, and claim your healing from all sickness and disease. Even if the healing breakthrough you desire does not manifest immediately, rest secure in the perfection of Jesus’ finished work and confidently expect to see your breakthrough come to pass. He is, today and always, “the Lord who heals you” (Exodus 15:26)! As you wait upon the Lord, we encourage you to focus and meditate on Jesus’ love for you and His finished work. To help you along, please visit God’s Promises On Health And Healing on our ministry website for a special selection of Bible verses pertaining specifically to healing. I've prayed about my situation, but nothing seems to be happening. So as you continue to trust the Lord to provide the breakthrough that you need today, don’t focus on your lack. Focus instead on the Lord’s love toward you and what He has accomplished for you on the cross. Meditate on how Jesus died poor, not having even a loincloth to cover His modesty, so that today, you “through His poverty might become rich” (2 Corinthians 8:9). We encourage you to rest in what Christ has already done for you. That is how God’s abundant supply comes, and that is how you shall walk in His provision for every need and reign over every circumstance of lack and insufficiency. My question has not been answered by any of the FAQs. If your question has not been answered by any of the FAQs, please contact us by clicking here. We would love for you and your church to be a part of the Grace Alliance network. We know that you will be blessed and encouraged as you connect with our global community of Senior Pastors and leaders.